An enthusiastic bus load of swimmers, track and field athletes and tennis players left the Lake Macquarie City Administration Building this morning bound for the International Children’s Games (ICG) in Jerusalem. 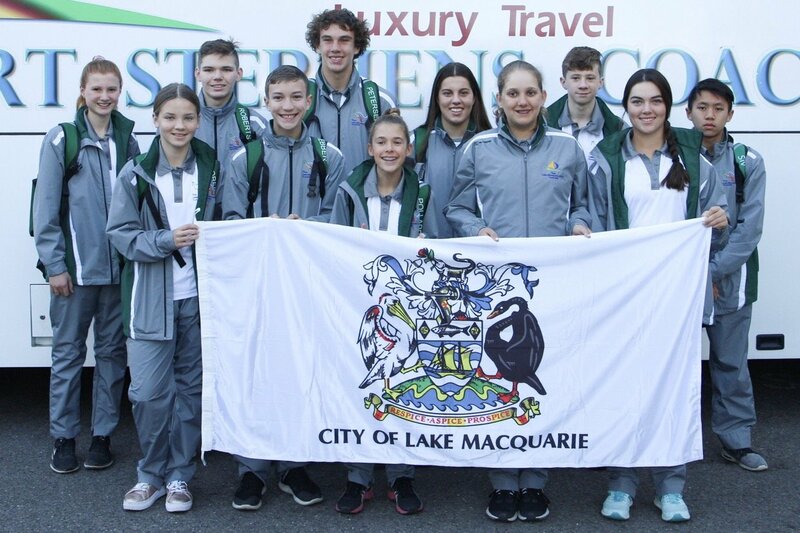 The 11 young athletes will represent the City of Lake Macquarie at the Games from 29 July to 3 August. The International Children’s Games is the biggest youth multi-sport event in the world. Children aged between 12 and 15 from countries all over the world gather in a different city each year to meet, compete and form new friendships. Lake Macquarie has been represented at the Games since 2008 and hosted the event in 2014. The Mayor of Lake Macquarie, Councillor Kay Fraser, will join the team for the duration of the Games. “I am really looking forward to cheering on our competitors in Jerusalem,” Cr Fraser said. “The International Children’s Games is a wonderful experience for young people that shapes them as athletes and leaders of the future. The members of Team Lake Mac for 2018 are: Millie Warham and Erica Wattus (tennis); Bryce Webber, Travis Petersen, Benjamin Roberts, Jasmine Roberts, Jemma Pollard (athletics); Caleb Baker, Dillon Siv, Emily Dobbins and Skye Southam (swimming). Coaches are Mavis Godber, Karen Leth, Warren Peterson and Christina Laurie. The team is managed by the Hunter Academy of Sport, led by Karen Turner as Head of Delegation.